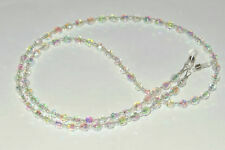 Clear Crystal AB Eyeglass Chain Holder. 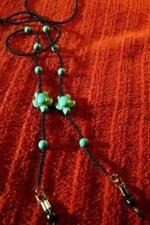 A HANDMADE LIGHT-WEIGHT ONE-OF-A-KIND EYEGLASS CHAIN HOLDER. Acrylic 6 mm Clear Crystal AB Round Faceted Beads. Acrylic White AB Pearl Spacer Beads. Beading Wire. 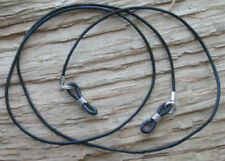 Adjustable Eyeglass Holders - slide the wire up or down to fit snugly on the arm of your glasses. 11/0 Dyna-Mites Crystal Silver Lined Seed Beads. 8/0 Dyna-Mites Crystal Silver Lined Seed Beads. 49 Strand Professional Quality Beading Wire. 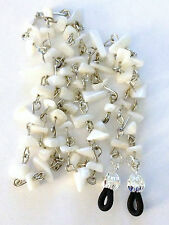 ~Handmade Beaded Eyeglass/Sunglasses Chain Holder~ Lots of Sparkle! Wire Guardians are used for added Durability. Made on Strong Professional Beading Wire. 29 " Length. Link Eyeglass Chain Holder. I am not a professional photographer and did the best that I could to show you the quality and colors of the eyeglass holder. 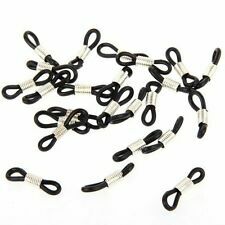 These Eyeglass Chains make great gifts for GRANDMAS, GRANDPAS, AUNTS, UNCLES, FRIENDS, TEACHERS and even for YOURSELF. This handcrafted beaded eyeglass holder is great for your reading glasses. The sodalite beads average 4mm. Sodalite is associated with logic, calmness, healing and self esteem. It resonates with the third eye chakra. This handcrafted beaded eyeglass holder is great for your reading glasses. The wood beads average 4mm. These have a light brown color tone with a weathered look. They have a lovely wood scent. The beads are lightweight making for comfortable wear. This handcrafted beaded eyeglass holder is great for your reading glasses. The wood beads average 4mm. The beads are lightweight making for comfortable wear. This handcrafted beaded eyeglass holder is great for your reading glasses. The black obsidian beads average 4mm. Obsidian is volcanic glass that forms when lava cools. Obsidian is associated with deflecting negativity, protection and healing. This handcrafted beaded eyeglass holder is great for your reading glasses.The landscape stone beads average 4mm. 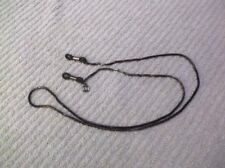 Lightweight 2mm Leather Cord. Material: Lightweight 2mm (approx. ---->>> NEW Clear Rubber Ear Piece Holders--- See Photo. Size: Cord length is approx. : 26”/66cm. ). This handcrafted beaded eyeglass holder is great for your reading glasses. The purple aventurine beads average 4mm. This stone have a mauve color tone. This handcrafted beaded eyeglass holder is great for your reading glasses.The crazy natural agate beads average 4mm. This stone has earthy gold brown tones as well as grey and cream, varying in saturation. This handcrafted beaded eyeglass holder is great for your reading glasses. The manmade sea opal glass beads average 4mm. This handcrafted beaded eyeglass holder is great for your reading glasses.The crazy horse stone beads average 4mm. This handcrafted beaded eyeglass holder is great for your reading glasses. The pink rhodocrosite beads average 4mm. This handcrafted beaded eyeglass holder is great for your reading glasses.The leopardskin jasper beads average 4mm. This stone features earthy tones including dark grey, red, rust and brown. Resonates with the root chakra. This handcrafted beaded eyeglass holder is great for your reading glasses.The silver leaf jasper beads average 4mm. This stone varies in gray tones and markings. Resonates with the root chakra. The manmade glass blue goldstone beads average 4mm. This handcrafted beaded eyeglass holder is great for your reading glasses.The gemstone beads range from 3mm to 4mm. Included are obsidian, fossil stone, magnesite, aventurine, rhodocrosite, agate, howlite, sodalite and jasper. This handcrafted beaded eyeglass holder is great for your reading glasses.The Italian onyx beads average 4mm. This stone, also known as Italian marble, is a calcite with occasional banding and color variations. This handcrafted beaded eyeglass holder is great for your reading glasses. The red aventurine beads average 4mm. This handcrafted beaded eyeglass holder is great for your reading glasses. The howlite beads average 4mm. This stone is white with a gray matrix. This handcrafted beaded eyeglass holder is great for your reading glasses. The snowflake obsidian beads average 4mm. This stone is black with gray markings. Obsidian is associated with deflecting negativity, protection and healing. This handcrafted beaded eyeglass holder is great for your reading glasses.The moss agate beads average 4mm. This stone varies in green hues to clear. Resonates with the throat chakra. This handcrafted beaded eyeglass holder is great for your reading glasses. The pink aventurine beads average 4mm. This stone is a very pale pink, almost white. The colors are beautiful turquoise blue, light sky blue and a silver tone chain with connector. The beads are very detailed and shapes vary. This necklace is lightweight considering it's glass and crystal. This handcrafted beaded eyeglass holder is great for your reading glasses. The wood beads average 4mm. These have a rich red brown color tone. The beads are lightweight making for comfortable wear. This handcrafted beaded eyeglass holder is great for your reading glasses. The black silk stone beads average 4mm. This stone is an onyx marble that is black with grey to white bands. This handcrafted beaded eyeglass holder is great for your reading glasses.The tigerskin jasper beads average 4mm. Resonates with the root chakra. This handcrafted beaded eyeglass holder is great for your reading glasses.The tree agate beads average 4mm. This stone is green and white, varying in color saturation. Resonates with the throat chakra. This handcrafted beaded eyeglass holder is great for your reading glasses. The African agate beads average 4mm. Resonates with the throat chakra. This handcrafted beaded eyeglass holder is great for your reading glasses. The green aventurine beads average 4mm. It resonates with the heart chakra. This handcrafted beaded eyeglass holder is great for your reading glasses. The carnelian beads average 4mm. This stone varies in orange tones. This handcrafted beaded eyeglass holder is great for your reading glasses.The moukaite jasper beads average 4mm. This stone features earthy tones including mustard yellow, gold, burgundy mauve and cream. RHINESTONE/ IMITATION GEMSTONE/ CZECH CRYSTAL/ GOLD PLATED EYEGLASSES HOLDER 30"
Materials : Acrylic Imitation Gemstone, Rhinestone, Czech Crystal. NWOT - IMITATION TURQUOISE/ CRYSTAL/ ACRYLIC/ SILVERPLATED EYEGLASSES HOLDER 30"
Materials : Imitation Turquoise ( Acrylic), Crystal. The fossil stone beads average 4mm. This necklace is lightweight considering it's glass and crystal. Can be customized to fit plus or minus the standard length. These make great gifts of fashion and purpose. Most have glass and crystal beads included on the chain. CULTURED FRESHWATER PEARL/ SWAROVSKI CRYSTAL/ JADE/ RHINESTONE/ GOLDPLATED EYEGLASSES HOLDER 30" - G8. Materials : Cultured Freshwater Pearl, Australia Swarovski Crystal, Jade Gemstone, Rhinestone. PEARL & CRYSTAL EYEGLASS NECKLACE CHOICE OF 2 COLORS CUSTOM & ADJUSTABLE up2 40"
HANDCRAFTED CRYSTAL EYEGLASS NECKLACE CHOICE of 5 COLORS CUSTOM + SIZE WOMEN 40"
Figaro Eyeglass Chain. Silver Tone. Light Weight. Most have glass and crystal beads included on the chain. If no length is requested, they are made at a standard 34" long. Can be customized to fit plus or minus the standard length. These make great gifts of fashion and purpose. 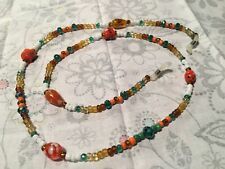 HANDCRAFTED CRYSTAL EYEGLASS NECKLACE 7 COLORS CUSTOM + SIZE WOMEN 40"
Most have glass and crystal beads included on the chain. If no length is requested, they are made at a standard 34" long. 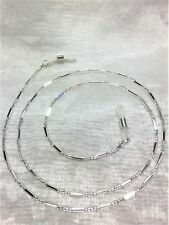 They are in black, smoke, and silver colors with a silver tone chain and connector.